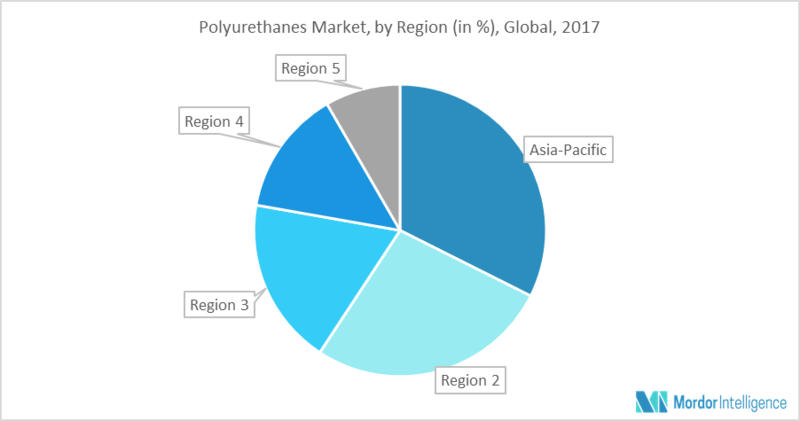 The polyurethanes market is expected to grow at a rapid rate during the forecast period, 2018-2023. Polyurethane-based foams are used as insulating materials in homes, refrigerators, and for many other uses. Insulating foams help consumers save on their heating and cooling costs. With the rising number of building codes that promote energy-efficient structures, home builders and consumers are gradually moving toward building strategies that deliver performance and energy savings in the long run. According to the Department of Energy, heating and cooling costs account for 48% of the energy use in a typical US home. Spray polyurethanes are important solutions in improving a home’s energy efficiency, along with other insulating foams. Various government projects, including Affordable Housing Initiative (AHI), New Building Canada Plan (NBCP), and Made in Canada are expected to hugely drive the growth in this sector, further promoting the use of polyurethane in the construction industry. Footwear is the largest end-user industry of polyurethanes. Footwear applications, including microcellular products and thermoplastic polyurethane products, accounted for more than half of the total consumption of elastomers. The consumption of thermoplastic elastomers is also expected to continue to increase, as a result of the gradual replacement of EVA (ethyl vinyl acetate), PVC (poly vinyl chloride), and other elastomer materials, for the production of footwear. Although polyurethanes are mostly used in sports and trekking shoes, it is also used for making business and fashion shoe soles, as well as in high-quality safety shoes extensively. Consumption of thermoplastic elastomers is also expected to be stimulated by their increasing usage in film applications. Elastomer is the largest non-foam application segment in the largest regional market (Asia-Pacific) of the polyurethane industry. The development of polyurethane in Asia-Pacific was strongly promoted by the growth of the footwear industry in China in the form of polyurethane elastomer. The Chinese footwear industry began with the shift of footwear production from Western nations to China, at the beginning of this century. The consumption of polyurethane elastomers in India and ASEAN countries has been increasing, as a result of the increasing production of shoes, sporting goods, industrial materials, and consumer goods. November 2017: Dow added new capabilities to serve the growing European polyurethane system market, in turn serving customers in the growing industrial and infrastructural markets. December 2017: BASF invested in smart supply chain Start-up Ahrma. Ahrma offered a complete, rentable supply chain solution consisting of a pallet coated with BASF’s Polyurethane Spray system Elastocoat C.
Polyurethanes Market Major Key Players: BASF SE, Huntsman Corp., Tosoh Corporation, Covestro AG, and DowDuPont, among others. 8.19 Saint-Gobain Performance Plastics Corp.